Try these simple set of instructions for walking meditation, and keep this chart handy for practicing on-the-go. At some point today, you will most likely walk. You may even go for a walk. It’s one of our greatest gifts, and when we manage early in life to use our legs to get around, it’s cause for celebration. Parents call their parents just to report on the event. The very fact that walking— or whatever form of ambulation you use to get around—is so central to our lives makes it a ready focus for mindful, meditative attention. Here’s a simple set of instructions for one form of walking meditation. There are many variations. This one relies on a pace that is close to how we might walk in everyday life, and in fact it can be adapted for walking in the street—just as long as you remember to pay attention to street lights, other people, and not looking like a zombie. Stand up STRAIGHT with your back upright but not stiff. Feel your feet touching the ground and let your weight distribute evenly. Drop your GAZE slightly. This helps you maintain focus. Step out with your left FOOT. Feel it swing, feel the heel hit the ground, now the ball, now the toes. FEEL the same as the right foot comes forward. Walk at a STEADY pace, slightly slower than in daily life but not funereal. When your attention wanders, bring it back to the sensations of your feet touching the ground. 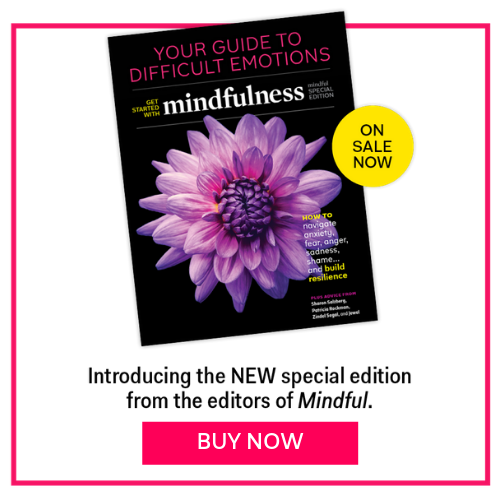 This article also appeared in the June 2013 issue of Mindful magazine.